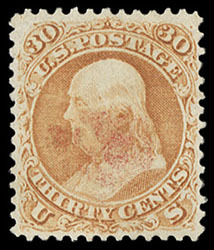 1861, 30¢ orange, light red cork cancel, nice centering and margins, strong bright color, Very Fine and attractive; with 1991 P.S.E. & 2006 P.F. certificates, the latter Graded (VF 80). A link back to Sale 81 - Lot 750, along with its description, will be appended to your message.